River's Edge | Arts and Culture | Style Weekly - Richmond, VA local news, arts, and events. In our haste to populate downtown, Riverside on the James offers lessons in urban planning. Since last summer the eastern end of the slender island has been repopulated with 9-to-5 workers as well as residential occupants. Their new abodes are two connected red-brick towers that join an already-existing power plant. The west tower is a 13-story structure with eight floors of office space, including anchor tenant Troutman Sanders, set atop a five-level parking deck. The 10-floor east tower contains 122 condominiums. Units on the south side of this building have balconies that all but reach out to touch the river. The views are a real estate agent's  and a resident'sdream. At the easternmost tip of Brown's Island, looms the spectacular (if currently roofless) shell of a former electric power plant. Its exterior comes to a crescendo at the bold concrete entablature that is a play on the Doric order of architecture. These new and old buildings have been cleverly configured to form a comfortably scaled piazza. This public space fronts the Haxall Canal and a vista of buildings beyond. The preserved early 20th century power plant is slated for conversion soon to house a restaurant. More important, it was this structure that provided cues the Atlanta architect, Rule, Joy, Trammell + Rubio, used in designing the high-rises. But where the power plant is aggressive architecturally in its form and volume, the new buildings are achingly conservative, almost prissy, considering their once-industrial setting and the infrastructure that surrounds them. Consider: There is the 19th-century canal; a dramatic elevation drop from the island to the river; the muscular railroad trestle; a nearby concrete floodwall; and the looming double towers of the Riverfront Plaza and other structures. Effete, classical design doesn't work here. Modernism, however, was invented for such a situation. Good modernist design incorporates an honest array of materials  glass, metal and concrete. And modernism is nothing if not about connecting the built environment with nature, connecting the outdoors and indoors through transparent walls and terraces. Instead, the exterior walls at Riverside on the James are covered in red brick, relieved with contrasting cast-concrete classical detailing. The parking deck is disguised (on the north side) with fairly elaborate detailing, including blind windows. 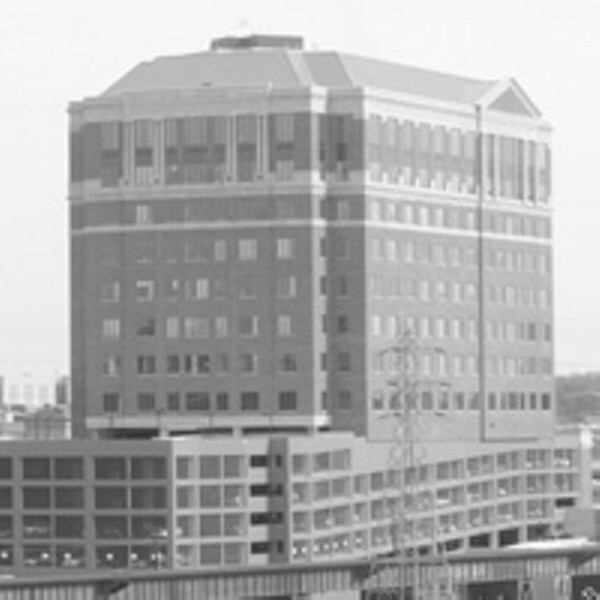 The office tower is capped with a classical temple form that recalls the roofline of the Tuckahoe near the Country Club of Virginia or the Cavalier, the venerable hotel at Virginia Beach. Apparently, there are those who find this sort of design reassuring in the 21st century. Trouble is, the complex is asked to provide more than polite office and residential spaces. Significantly, it also includes a parking deck that must be reached by crossing the Haxall Canal by way of one of two bridges that link Brown's Island with the mainland. These flyovers are actually the most exciting part of the complex because they are what they are  bridges. There wasn't any way to disguise them. And what they add is another layer of infrastructure that enlivens the industrial-looking environment here. The bridges contribute to a sense of urban energy and beauty similar to that which occurs at Dock and 17th streets (near Bottoms Up) where elevated train trestles, raised highways, the floodwall and blocky warehouses converge. The Disney-like classicism of the Riverside on the James exterior might be forgiven if the outdoor public spaces had reconnected the place with the river. But no: The buildings create a barrier wall that denies pedestrian or visual access to the rapids. In fact, the buildings turn their backs to the river architecturally  the downtown-facing side of the west tower offers a facade of windows and architectural filigree  but ironically, the rougher river side with its exposed parking deck is more honest. If one thinks too hard about Riverside on the James, a more fundamental question arises: Why are we even building towers  and parking decks, for heaven's sake  at the river's edge? Well, the answer is so those who work and live here can enjoy unparalleled and unobstructed views of the water  and get to their cars without stepping out of doors. Good for them, but bad for urban design, inclusiveness and reconnecting with the river. In our gee-whiz rush to repopulate downtown and build along the riverfront, we shouldn't be too quick to applaud every bandwagon that comes along. As construction of another residential tower gets under way at 14th Street, a baseball park is discussed for Fulton Bottom and Rockett's Landing evolves, serious questions should be asked: For example, how do we create win-win situations that meld private interests and public access while respecting natural and historical resources?